Today on History Undressed, we have a special guest author, Marjorie Gilbert who is going to take us through the making of an empire gown! 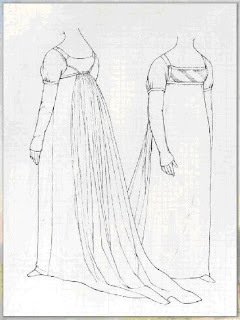 Because I am a fan of Jane Austen, I thought I would be a fun project to make an Empire gown using Janet Arnold’s book Patterns of Fashion 2: Englishwomen's Dresses and Their Construction, C. 1660 – 1860. I had already made a Spenser from the book that was from the same era, so I thought the project would be fairly easy. Here’s the pattern: a line drawing on graph paper in which every square equals an inch. For some reason the words, circa 1798 to 1805, did not have the proper resonance they should have. 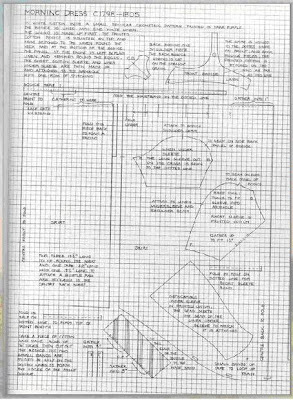 The first time I made the gown, I followed the pattern exactly, making the pattern pieces that same size as drawn. And, when I tried on the bodice, I found that it was far too small. In fact, I could not move my arms, rather like the Randy in the Christmas Story. I had to make the bodice bigger. But here’s the thing: I’m not a trained costumer, and I’ve never sized up patterns for myself. I’ve only worked with patterns someone else has kindly sized for me, like the nice people at Simplicity, McCalls, or Folkwear. This was challenging, to say the least. 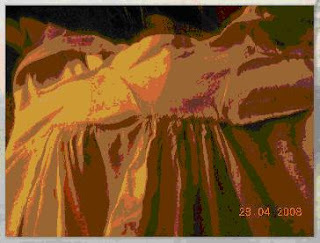 My second go-round was better, in that the bodice was bigger. 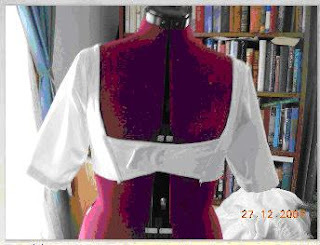 However, the bodice didn’t fit properly and concealed rather revealed. Well, half concealed and half revealed—in any case it was embarrassing. Here’s the three stages of the patterns. 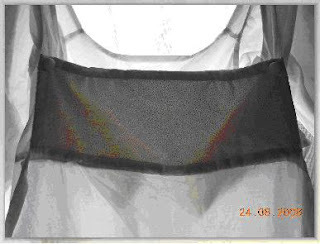 As you can see, the bodice back grows larger and larger along the bottom of the picture. 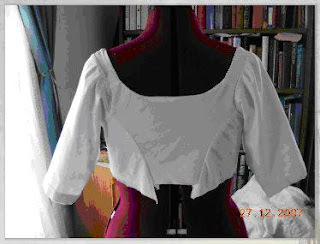 The third time around I decided to take no chances, and made a mock-up of the back, sizing up the pattern each time until I got it right. 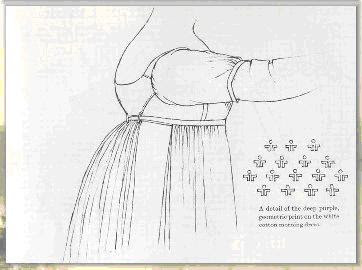 Once I got that down, I began putting together the bodice. Oh, yeah. I made two of them because, well, I plead the fifth. My second choice was far better: an off-white jacquard pattern on a white ground. Marjorie Gilbert is author of The Return, a novel set in Georgian England. Check out her website at www.marjoriegilbert.net. I am impressed! A few conferences ago (RWA), someone did a workshop and I was amazed to see ho complex these seemingly simple dresses are. 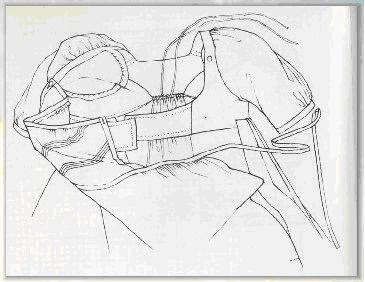 On thing that was stressed in connection with the fit, especially in the bodice, was the use of stays. I always thought these dresses would be like the empire waists we wore in the '60's. You know. Just pull 'em over your head. Uh-Uh. There was a reason people had sisters and maids! The writer giving the workshop said she would get annoyed reading Regencies where the hero practically undresses the heroine on the balcony and then they dress and go back to the ballroom like nothing happened. As she said, it just ain't that easy to get into one of these things! Lovely dress, Marjorie! I can't sew a lick and have huge amounts of repect for those that can. 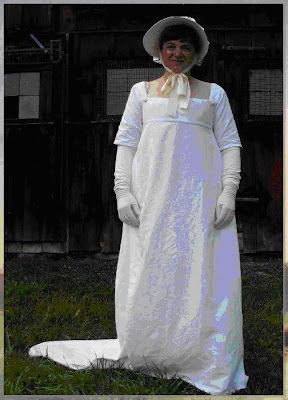 I thought the gown turned out beautifully. Your post was very insightful. I would not have guessed the pattern would be such as it was. Your ability to understand and make it work for you is proof of your talent. Wow, Marjorie! This is fascinating. You put a lot of work and effort into your gown. And the result is fabulous! I am not very domestic, I'm afraid, so I won't be making any gowns, but it's very cool learning about all that goes into it. What an intricate undertaking, Marjorie! And such lovely results! Thank you, Eliza, for bringing us this very impressive article. Thank you for your comments! The gown was a fun project, and I think it will take me far less time should I ever consider doing something like it again. Putting on stays *is* rather a process. I've read about looping the laces over a newel post and tightening them by walking away from it, but find having my husband help me much better. There were period front-lacing stays, but of course my aren't. Thank you again for your comments! Happy spring! My grandmother used to work in a dress factory. 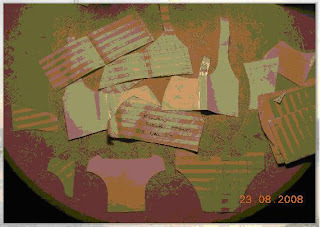 She would see a dress in a story window, go home and make a pattern out of a paper bag or a newspaper and cut everything out and make the dress. I believe she would have fit right into the Regency period. I did not inherit any of her tallent as far as that goes. I admired your determination in getting the dress made and it looked very fetching. 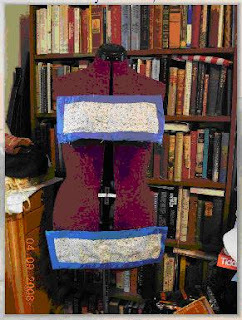 I once made an Empire style dress but had to modify it for a person who lived alone. 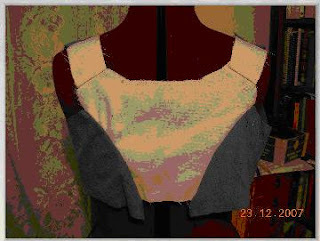 The bodice was not easy to make. There was only one piece in the skirt and about ten in the bodice. The people of that period did not seem to need ease in garments. I can't imagine how they moved their arms. You are really to be commended. This dress is beautiful. Great work and thanks for sharing. I can definitely use this information.